Comfort food for chilly weather! Preheat the oven to 350°. Season the lamb with salt and pepper and dredge in flour. In a large pot with a lid or dutch oven set over medium-high flame, heat 1/4 cup of olive oil. Evenly brown the lamb for about five minutes. Remove the lamb and add the onions and carrots. Sauté the vegetables for approximately two minutes until onions are translucent. Add the garlic and sauté for an additional minute until fragrant. To the same pot, add the wine, scraping all the browned bits of flour from the bottom of the pot. Simmer for approximately two minutes. Add the reserved lamb, pre-soaked beans, tomatoes, stock, bay leaves, rosemary and stir to combine. Adjust the seasoning and place the covered pot in a preheated oven for three hours. Remove the bay leaves and rosemary stems. 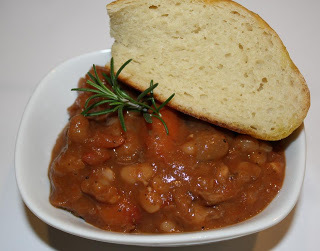 Re-adjust the seasoning and serve the warm stew drizzled with additional olive oil and warm crusty bread.